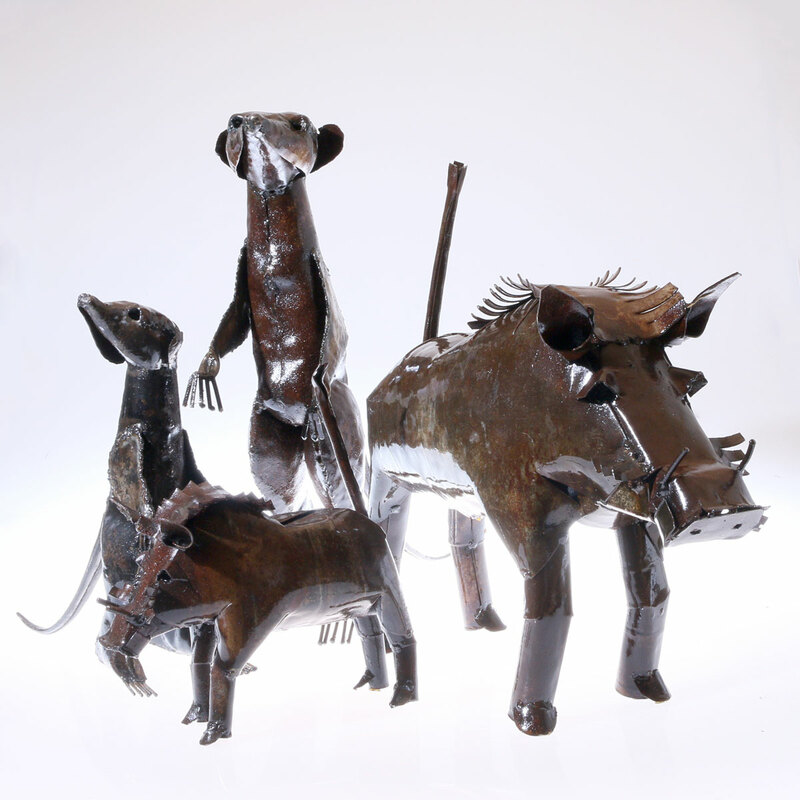 Handmade and fair upcycling animals (meerkats and warthogs) from Zimbabwe for decoration in the house or also on the balcony, in the garden or to greet friends in front of the front door. But what exactly is upcycling? When items are creatively reused after their actual "life cycle", we speak of upcycling. If things are used differently than originally thought, great art objects are often created that are not only unique, but whose production also saves natural resources. 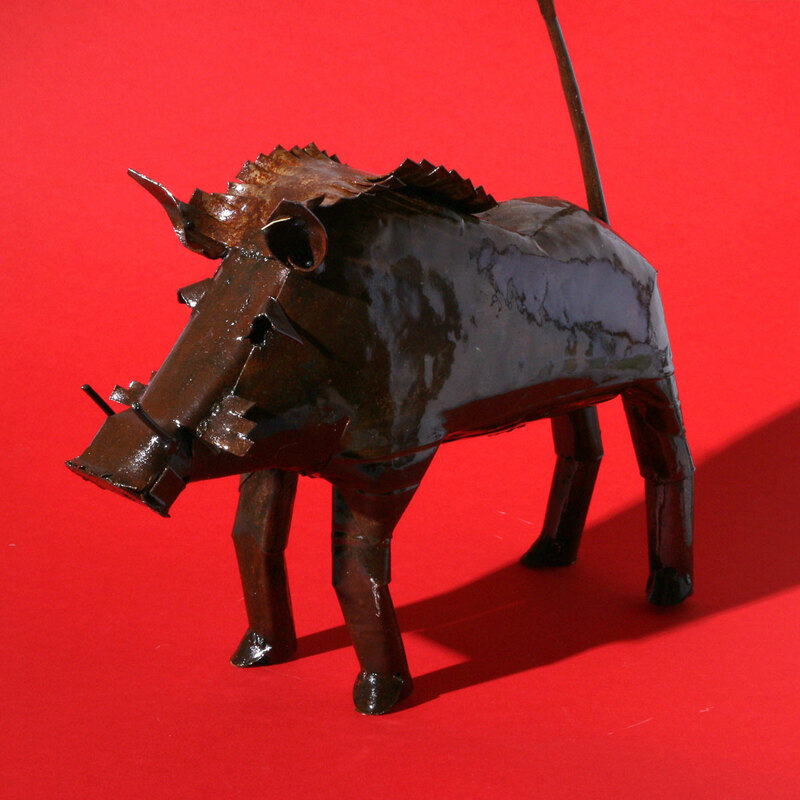 The upcycling metal animals are handmade from old oil cans, metal sheets, screws, tubes and sometimes wires. It is mainly young artists who use metal scissors and welding machines to create impressive, often vivid objects. Upcycling creates beautiful art objects from old metal remains, which decorate every flat, every house, every balcony or garden and enlivens them in a fun way. These beautiful handmade and fair trade upcycling animals are lacquered with clear lacquer. The decorative animals are thus protected from rust and are weatherproof. These cute handmade metal upcycling animals are handmade by the metal craftsmen Forget Gwishiri, Gibson Makarutse, Victor Mhembere and Assan Banda. The craftsmen make these cute warthogs and curious meerkats with great attention to detail and impressive creativity. All Shona artworks are fair, handcrafted and of high quality. Handcrafted means that the artworks are unique pieces and may vary slightly from each other. Each meerkat looks a little different, each warthog varies from the next. SHONA-ART consciously differs from industrially manufactured goods. Meerkats (Suricata suricatta) are mammals of the mongoose family. Meerkats are the smallest of the mongooses. Meerkats have a light grey coat with inconspicuous horizontal stripes. Meerkats live in dry regions in southern Africa. They live in groups of four to nine animals. Meerkats are characterized by their pronounced social behavior and feed predominantly on insects. They are not endangered species. At the latest since the "Lion King" and the lovely warthog Pumbaa became known, warthogs are also known and loved by us. Pumbaas and Timon's philosophy of life is Hakuna Matata (There are no (hakuna) problems or difficulties (Matata)). Don't worry, be happy! Warthogs (Phacochoerus africanus) are a mammal species of the Suidae family that is native to large parts of Africa. Warthogs are diurnal animals. During the hot lunchtime, however, they rest in the shade of trees and bushes. Warthogs spend the night in caves in the ground. Warthogs usually use the buildings of aardvarks or also small rock-caves. Warthogs are sociable and live in family-groups of four up to 16 animals. 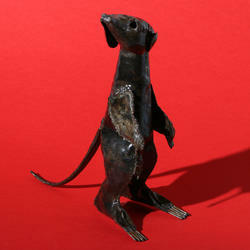 The handmade and fair trade upcycling animals are available in two different sizes.